alaTest on kerännyt ja analysoinut 324 arvostelut lehdistä ja verkkosivustoilta. The best thing can come in the smallest packages! Very small footprint but an outstanding set of features packed inside, not sure I'll use all of them but it is nice to know they are there. For now the job of playing BlueRay Discs is done easily, quickly and to the highest quality. This is a great player for money, with tons of features, It would be the ultimate player if it had no cons that i listed, even if it was more money. Does not play FLAC. "Easy to install and set up. Good quality and small piece ilif kit. 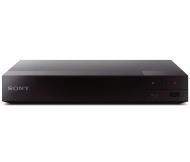 Bought this to replace a PS3 that we were previously using to watch Bluray. Very happy with the purchase." "Nice and quiet, replacung bit of a noisy player, and quick. Sleek machine for price"